This office space is located within a large, elegant building and is home to a multitude of useful amenities to help set up your business and develop going forward. The centre has great natural light throughout the day and there is high-speed internet alongside shared kitchen facilities, videoconferencing, meeting rooms and voicemail services. 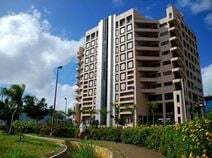 The centre is perfectly situated 15km south of Port Louis city centre, meaning that it is possible to stay connected to the centre while it is possible to take advantage of an array of useful amenities such as restaurants, shops, pharmacies and banks.